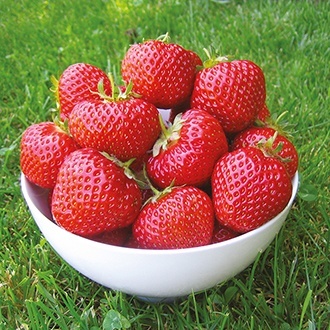 Strawberry Fenella is big fruited, sweet tasting recent strawberry introduction which has been described to us as "a modern Cambridge Favourite, it will do what Cambridge Favourite did for strawberry growing in the 1950's!" Fenella is a late season variety with superb resistances to weather and verticillum wilt and crown rot. Will fruit from end of June to end of July. Fenella was bred in England and has a strong upright growth and will deliver over a long period. We thoroughly recommend Fenella, a flavoursome and reliable strawberry. Delivered as dormant bare rooted A+ grade plants. A+ grade plants are grown through the summer months and covered with fleece in the beginning for added protection – only plants with a 15mm+ diameter size fall into this grade. They are characterised by having very well developed root systems and, on average, will go on to produce 3-4 trusses per plant which in turn will help to generate more flowers and fruit – 400g+ of berries per plant! We trialled A+ grade plants against standard runners in our trials and were very impressed with the results – around 50% more berries were harvested from the A+ grade plants!